Even though the scenery paintings date back to the ancient Greeks and the Romans, after the fall of the Roman Empire nature scenes became just a backdrop for religious stories or a mere setting for human activity. It wasn’t until the Renaissance era that artists started painting landscapes as a subject in its own right. These naturalistic elements such as a landscape have sparked a general interest in studying the natural world. Albert Altdorfer’s Landscape with Footbridge is considered as the first real landscape. 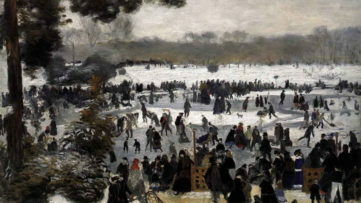 Idealized landscapes first began in the Netherlands as an alternative to the contemporary religious subject-matter, as the rising Protestant middle class sought secular art. The landscape was perfected by the seventeenth century and it portrayed nature as serene and harmonious, where each tree, animal or rock was carefully placed within the composition. Still, it wasn’t until the eighteen century that landscape was recognized by the powerful art academies of Italy and France, which led to its complete supremacy in the century that followed. Gustave Courbet pushed the boundaries of landscape painting with his distinct use of paint and paved the way for the next revolutionary movement – the Impressionism. Inspired by Courbet’s work, painters such as Monet, Pissarro, Renoir, Cezanne or Sisley have spent the majority of their careers exploring and painting this subject. 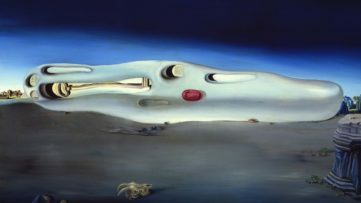 Throughout the 20th and 21st century, the notion of a landscape evolved greatly and broke all boundaries, becoming a subject for experimentation both in the figurative and abstract art. Without further ado, we bring you a selection of our favorite scenery paintings that you can contemplate on. From the vast world of Western art history, a renowned art historian Nils Büttner has made a selection of paintings portraying nature, as well as dramatic scenes with people and architecture. This broad selection features celebrated works, but also less famous one. Presented chronologically, the book begins with the ancient worlds and the precursors of landscape artists in the Middle Ages and Renaissance including Leonardo da Vinci, Giovanni Bellini and Raphael. Tracing the history of the landscape painting from ancient worlds up to the present day, this richly illustrated book follows the development and evolution of the medium from Albrecht Dürer and Rubens, through Constable and Winslow Homer, to Monet, Rousseau, Georgia O’Keeffe and David Hockeny. Focusing also on individual paintings and circumstances under which they were created, Büttner presents descriptions and analysis of the work’s cultural, historical, and aesthetic context. A founder of the Impressionist movement, Claude Monet rejected the traditional approach to landscape and developed his unique style. He carefully observed and captured the changes in color and light during various times of the day or seasons. 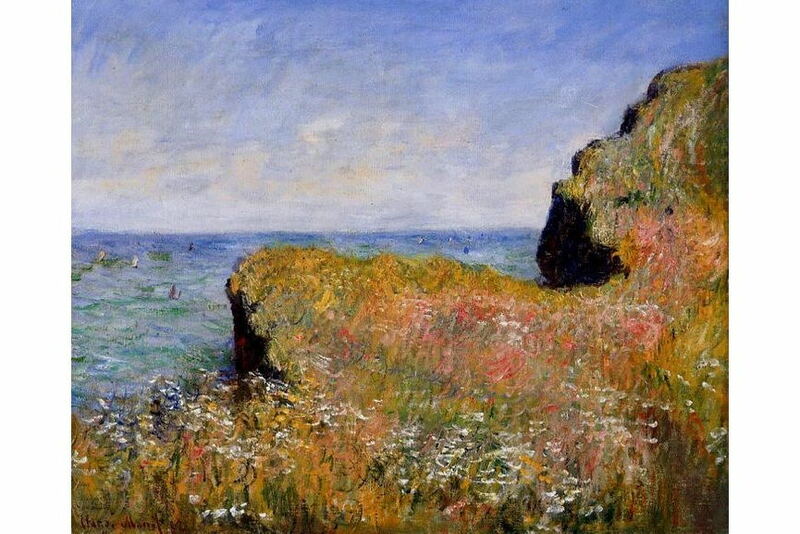 The painting Edge of the Cliff, Pourville from 1882 features a cliff above the sea Purville that was a recurring subject for Monet and was inspired by his stay at Pourville. Monet has used short and crisp brushwork and a sense of the movement is suggested by painterly calligraphy, a property of Monet’s work in 1880s. It is noted that the secondary cliff was later added to the canvas. Johann Joseph Eugene von Guerard was born in Austria but moved to Australia in 1852. Knowing the art of the European landscape painting from Dusseldorf Academy, he started painting Australia – his new home. For sixteen years Guerard travelled and sketched in the wilds of Victoria, Tasmania, New South Wales, South Australia and New Zealand. He painted grandiose landscapes, real and imagined, seen and remembered. 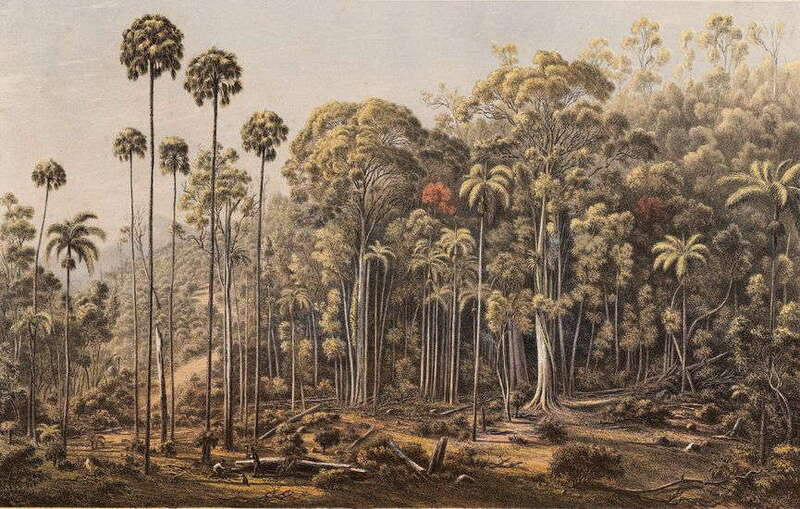 His vision of primeval forests, its dark recesses, live cabbage-trees, bangalow palms, and huge ferns have a fantasy feeling emphasizing the newness and strangeness of these images. As one of the most original American artists of the early twentieth century, Georgia O’Keeffe was one of the first artists to represent the landscapes of the American Southwest. She has developed a very unique and personal style of abstract painting very close to the figuration. 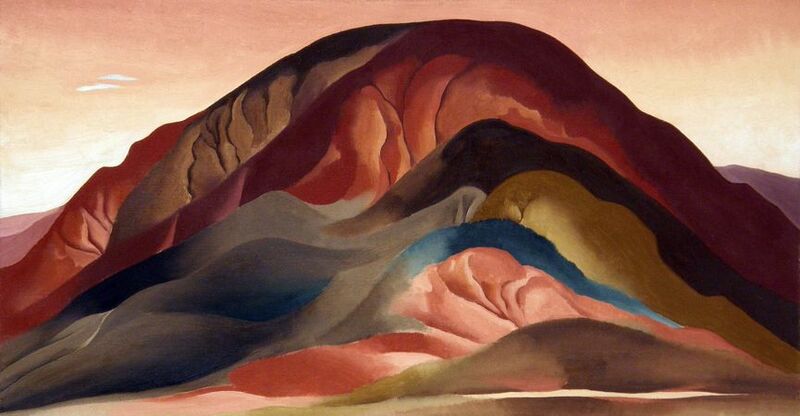 The painting Rust Red Hills is a perfect example of O’Keeffe’s unique use of abstraction and stylization. This deeply creviced strata of earth resemble intestines. The painter was fascinated by these hills in the New Mexican village of Abiquiu, and was returning often to find new sources of inspiration as these landscapes revealed in the different light each season. Often described as naïve, primitive, savage, the art of Henri Rousseau is arguably one of the most original and uninhibited artistic expressions that emerged after Impressionism. 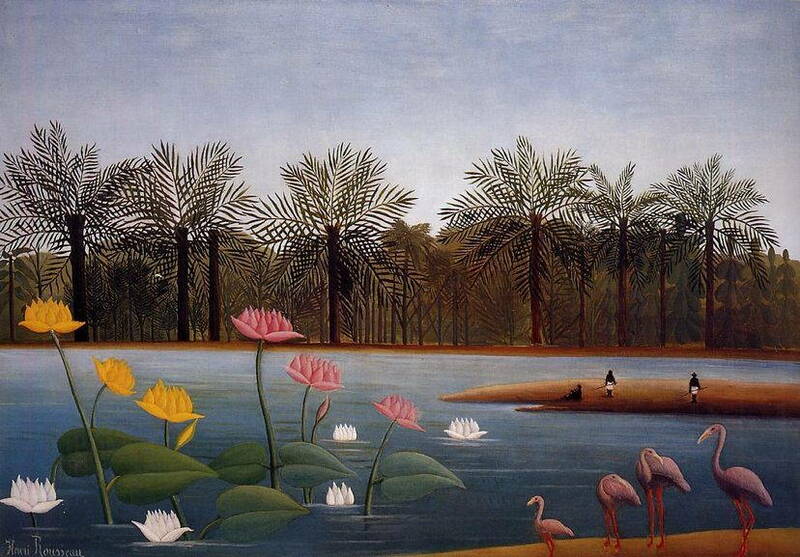 A self-taught painter that became an artist at the age of 49 after retiring from his job at Paris customs office, Rousseau used amateurish technique and unusual compositions that were shunned by the art critics of the time, but praised by Picasso and Kandinsky for ‘the new possibilities of simplicity’. Famous for his lush jungle scenes, his works were imbued with a sense of mystery and eccentricity. 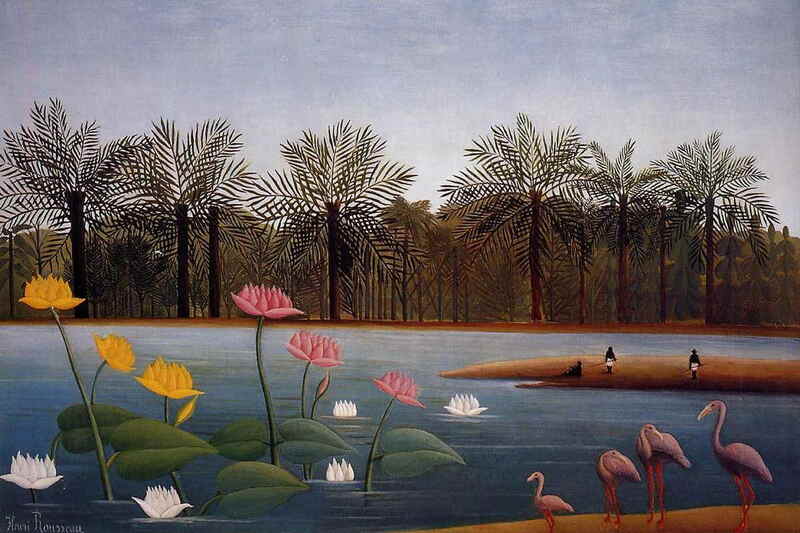 His famous painting The Flamingos depicts three flamingos in the pond surrounded by lilies and jungle and is painted with a consistent repetition and flow. Often considered the first landscape painter in the history of Western art, Joachim Patinir created landscapes that were religiously themed. His works have influenced greatly the greatest Flemish and Dutch landscape painters of the following century. 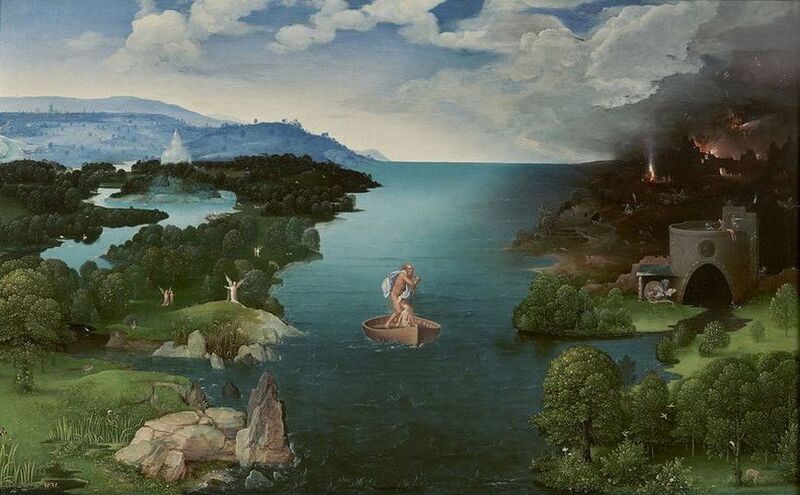 The most famous Patinir’s painting, Landscape with Charon Crossing the Styx depicts a human soul who is being stranded between heaven and hell. With a kind of triptychal composition resembling the infamous The Gardens of Earthly Delights, the painting is rich in details and full of different divine and hellish figures. The use of colour is typical of the era. A famous Yugoslav painter Karlo Mijic was best known for his colouristic landscape paintings. With art nouveau and impressionist influences, Mijic was arguably one of the greatest painters in the 1920s and 30s Kingdom of Yugoslavia. Together with the painter Djoko Mazalic he founded the art association called ‘The Circle’ that had strong urban aesthetics of nature. His famous painting Mountain Landscape is a soft depiction of rough Bosnian mountains. Before leaving for Tahiti in search for the primitive, Gauguin studied Impressionist methods for portraying nature and experimented with new colour theories. The landscapes of Brittany have influenced his works greatly as he spent one whole summer there. There, he created works in an intensely colorful style. 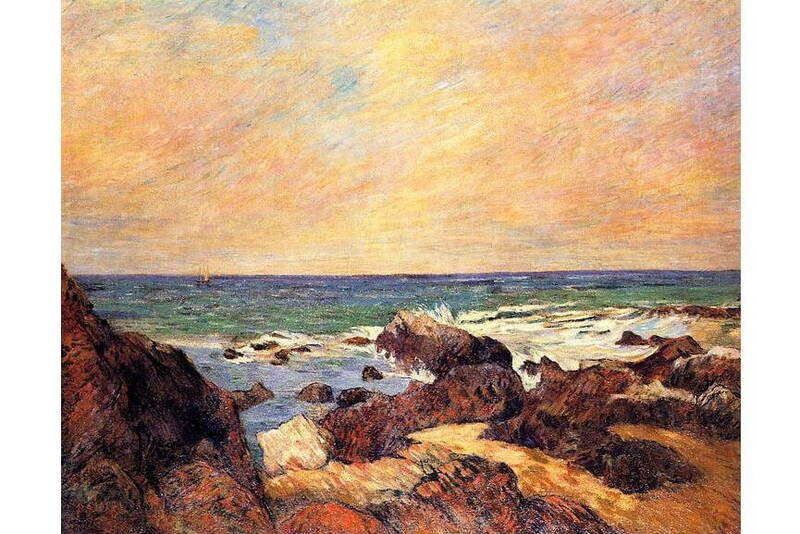 The painting Rocks and Sea is a depiction of a rocky coast of Brittany in the dusk. 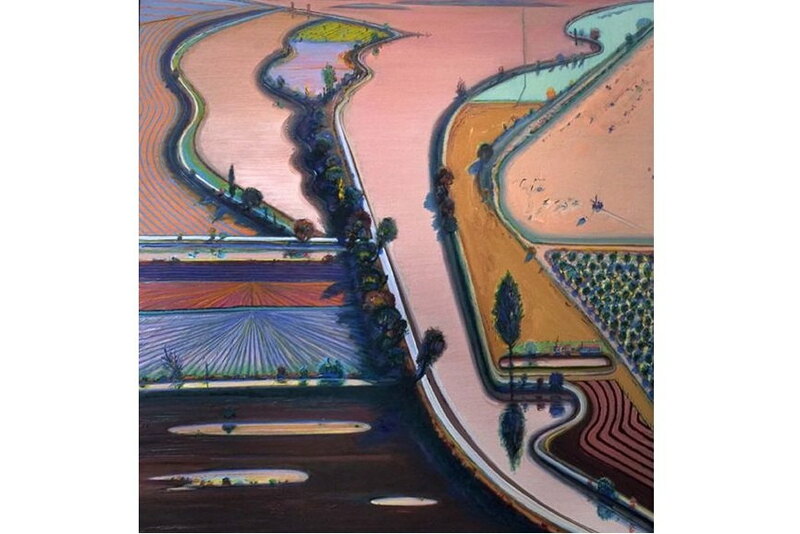 Best known for his ‘pop’ paintings of supermarket products or cakes and pies, Wayne Thiebaud has dedicated a significant part of his career to landscapes, both natural and urban. He uses heavy pigment and exaggerated colours and well-defined shadows that are usually characteristic for advertisements. The landscape pictures he painted 15 years ago are inspired by an almost forgotten corner of American countryside. Featuring an image of California that existed a long time ago, the road that goes high above the Sacramento river gives a view of river banks dotted with fishing stations and bait and tackle shops and orchards and farm fields. His painting Levee Farms from 1998 features shifting perspectives and geometric patterns in unexpected hues such as candy pink or baby blue. A famous American landscape painter and a leading figure in American art, Winslow Homer is best known for his marine subjects. Concentrating on the beauty and the force of the sea, he created works with dynamic compositions and rich textures. 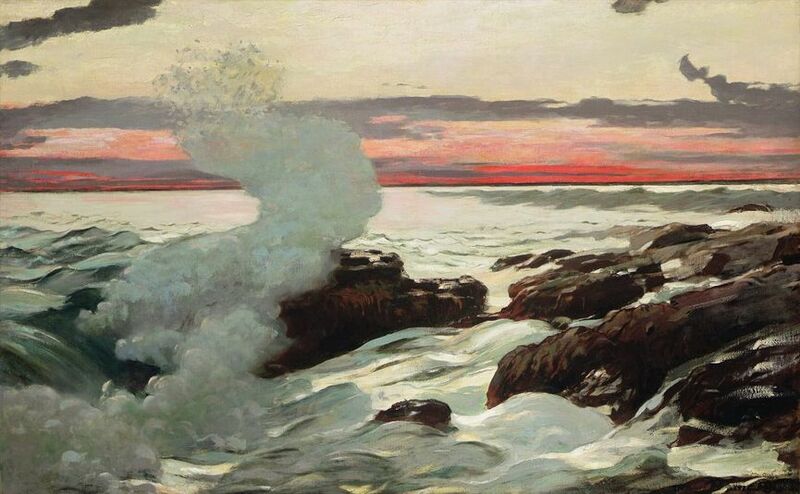 The painting West Point, Prout’s Neck from 1905 features surging seawater and massive rocks against a rosy horizon. It was painted fifteen minutes after sunset, as Homer himself wrote. He considered it as one of his best paintings that managed to capture such a fleeting moment after many days of careful observation. 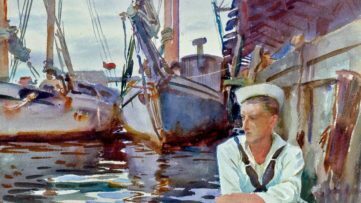 The painting was created at the Maine coast near his studio in Prouts Neck. 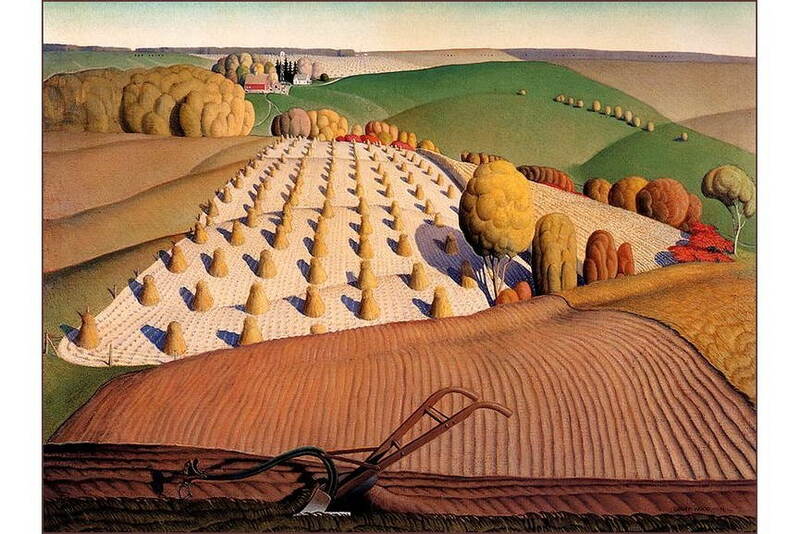 A famous American painter, Grant Wood is best known for his paintings depicting the rural American Midwest. His rolling hills, tiny farmhouses and swaths of country roads draw the viewer in. 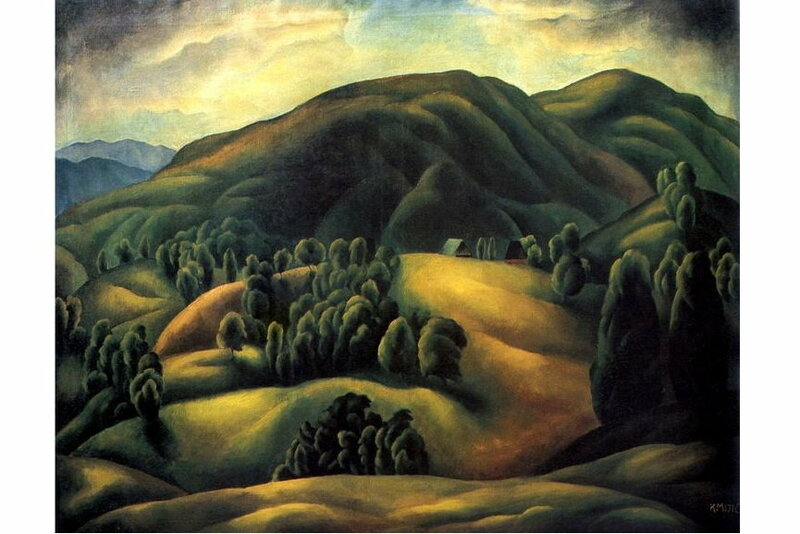 He painted in the unique style that he has developed through the late 1920s and 30s, stylizing the hills and trees into characteristic swellings and ovals – a style that remained his visual characteristic for the rest of his life. The painting Fall Plowing was painted in a historical district near Viola, and it features the agrarian life of rural Iowa. With fluffy and round trees, curved lines of hills and sharp rows of planting and hay, the painting is his seminal work and a perfect example of his unique style. Rene Magritte, a celebrated surrealist Belgian painter, created works that are beautiful in their clarity and simplicity, but also provoke unsettling thoughts. He described his paintings as visible images that conceal nothing, but evoke mystery. Featuring everyday objects placed in unusual contexts and juxtapositions, his paintings challenge the assumptions of human perception and force the viewer to reconsider things usually taken for granted. Magritte pondered his famous painting The Glass Key for three years, dismissing 50 titles before finally calling it after the novel by Dashiell Hammett. 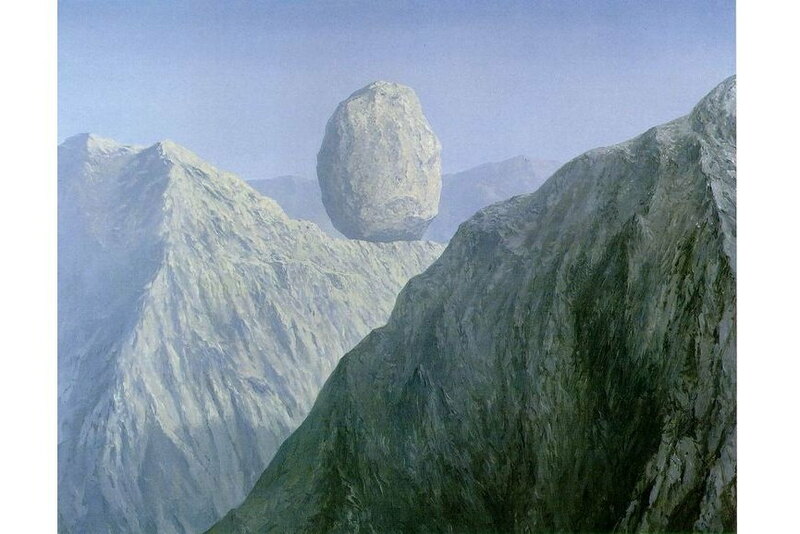 This imaginary landscape features a rock sitting improbably on a mountain top that he described as ‘absent of thought – the absolute’.